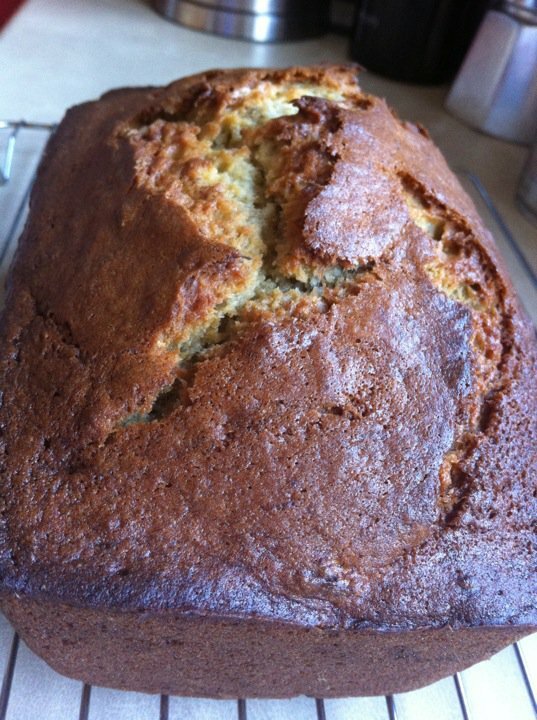 Banana bread is one of my favourite things on earth. It's one of the tastes of my childhood and became a staple during all of my pregnancies. When I was pregnant with Jack, I discovered that Nutella smeared on a piece of banana bread was a lovely, lovely thing. (And my considerable girth at the end of that pregnancy was proof of my love.) When I was pregnant with Mia and Isla, I got the urge to bake towards the very end - probably part of that so-called "nesting phase" - and made loaves of banana bread just before they were born. In fact, before yesterday, the last loaf I made was the day before Isla arrived. So to all you heavily pregnant and fed up ladies out there, banana bread may be your answer*. Paul and Jack returned from school on Friday with a carrier bag full of very ripe bananas, which was obviously a sign from the gods that I should bake. Banana bread was a given, and a quick poll of my friends and a scan through my cookbooks gave me a few more ideas. So first, my Mom's banana bread recipe. I think this came from one of our church cookbooks when I was a kid. All I know is that Mom has been using this recipe for as long as I can remember and it works every time. I think that the flavour gets better with age; banana bread is best eaten later that evening or the next day, in my opinion. I keep mine in the fridge because I like how dense and chilled it gets, but feel free to keep yours wherever you'd like. It also freezes well; slice it up and put greaseproof paper between the slices before freezing, and you can either defrost the slices gradually on the worktop or stick them in the microwave for around 20-30 seconds if you're impatient. This is a cake rather than a bread (despite the name), in that it's quite sweet and doesn't really require anything on it. Unless, of course, you enjoy Nutella and have a massive sweet tooth. Preheat the oven to 350F/180C and grease a loaf pan. In a medium bowl, sift the flour with the baking soda and salt. In a large bowl, cream the butter and sugar until it's light and fluffy. Add the eggs and mashed bananas, and beat until they're thoroughly incorporated. In a mixing jug, combine the milk and lemon juice. [I suspect that this was a substitution for buttermilk (perhaps adapted from the original recipe), so I'm sure you could use 1/3 cup of buttermilk in place of the whole milk and lemon juice.] Add about 1/4 of the dry ingredients to the banana mixture, then a tablespoon or so of the milk mixture, and continue alternating like this until everything is mixed in, ending with the dry ingredients. [I don't really know if this matters, but it seems to be a common instruction in a lot of North American baking recipes. Whether or not starting and ending with dry ingredients and alternating like this does anything magical to the finished product is a bit of a mystery to me. But it's what I always do, and I'm too lazy to experiment and see what happens if I just bung everything into the bowl.] Bake for around an hour. When a cake tester comes out dry, it's done. Let the bread cool a little, then turn it out on to a wire rack to cool completely. Don't try to slice it before it has cooled, or else it'll crumble all over the place. 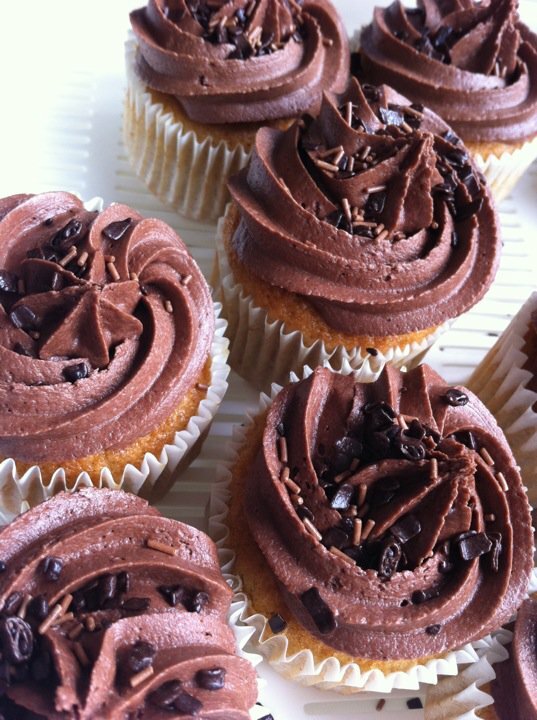 The second recipe of the day was for banana chocolate muffins, courtesy of the Hummingbird Bakery cookbook. Now, I know that many people are not fans of this book and I've heard several people complain that many of the recipes don't turn out properly. Me, I've never had anything go horribly wrong and I've enjoyed the recipes I've tried so far. But having said that, I think this recipe does need a little tweaking. It calls for 1 tsp ground ginger, which for me, was far too overpowering and almost completely masked the flavour of the bananas. This is very apparent if you try the cupcakes without the icing, as I did when I shared a sample uniced cake with Isla. The ginger does work with the chocolate, but it's still very dominant. Next time, I'll leave it out. Also, it calls for 1 tablespoon of baking powder which sounds like an awful lot to me, but I did use it and it worked fine. I won't include the recipe here as many others have posted it and I don't want to make the nice people at Hummingbird grumpy by copyright infringement. Suffice it to say, these are worth making. Feather light, delicate, and delicious. A big hit with all three kids, and Mia thoroughly enjoyed mashing the bananas. Thanks to the advice of my friends, I've frozen the rest of the bananas for another baking day. Which should go well, provided I don't confuse them with the bananas that have been sitting in my freezer since I was pregnant with Isla (originally intended for energy-providing smoothies during labour.) Which reminds me of the time I defrosted my freezer back in Montreal and the ice was so thick, a bag of corn I forgot that I had plopped out when it melted away. My freezer: a voyage of discovery and ancient artifacts. ahem if you have surplus I can help!